You have to be careful when you dig deep for the tapes in the basement. You never know what band you might find. Here's Shadowcast, an obscure one from the late Eighties in minor metropolis of Dayton Ohio. Begun in 1988, the band lasted only two years, yet cut two four song demos, probably on cassette. The eight songs are assembled here along with a radio interview as The Premonition. Label Arkeyn Steel is billing Shadowcast as a progressive metal band, but I wasn't sure at first. 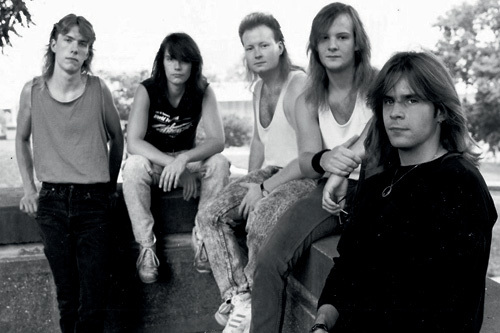 They say the band took their cues from Fates Warning and Queensryche. Does that make them proggish? Yet, after several listen I begin to here some technicality, shifts in tempo, time signature, and passages. It come through within Necropolis, especially Prelude, and notably Hell Born On Earth, which has this schizoid metal fusion climax lead by the bass line. Fundamentally, the songs demonstrate some creative song writing and arranging skills. It's too bad that the production sounds low budget. The recording seems soft, the vocals muted. As a pleasant surprise the interview is actually quite interesting. The band talks about their start, influences, and song development of several songs. And, they actually the band members sound both affable and intelligent. The band disbanded after two short year which is a shame. They had some promise. All members are still involved in music excepting the vocalist Nathan Vai. He's a detective for the Dayton Police Department. From heavy metal to cop. Why not? If you would like a look and listen into some late Eighties seminal American progressive metal in a local context check out Shadowcast's The Premonition. 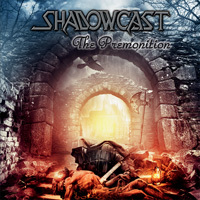 If you would like a look and listen into some late Eighties seminal American progressive metal in a local context check out Shadowcast's The Premonition.